Sorry guys for the super late Recap post. After CRCRC I had a week at home and I was very Motivated for Reedy. I went and got three days of practice at home and was ready. Reedy Race is a unique race event, the Invitational class consists of combined racing with 2wd Mod Buggy and 4wd Mod Buggy. 30 drivers are invited and we have three heats of 10 drivers. The races are all setup random, we race six races in 4wd, with one throw out, then six races in 2wd with one throw out. First gets 1 point, tenth gets 10 points, add up all ten of your counting scores, lowest score wins. I flew out Wednesday afternoon and that day is just registration and tire mounting for the Invitational drivers. The Reedy Race is a spec tire race, JC on 2wd and PL on 4wd. I got two sets for each class mounted and ready, so I was ready for practice. 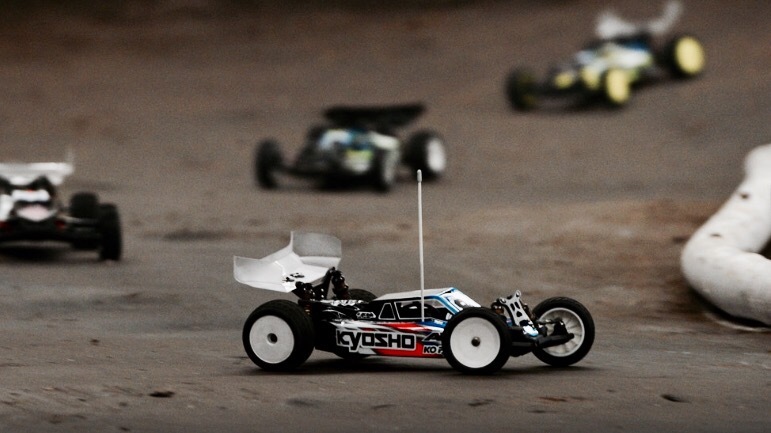 I was starting with my cars almost identical to how I ran them at CRCRC. For 2017, they changed the program a little and ran 4wd first and 2wd last. That was mainly because the JC tires are much looser than the PL when we can not break them in. The track gains grip everyday, so starting with 4wd will give us better traction for 2wd. Thursday we got three 5 minute practice sessions with each car, so I would see the track six times before racing starts. Both my cars felt really good right away and I was feeling comfortable on the track. The right side was a little more technical and took a little more time to get all dialed in. I ran one set of tires the first two runs, then ran my second set in the third practice session. Friday would be four races with 4wd. Race 1 : 10th/5th : I would start 10th in a fully packed heat with Phend, Cavalieri, and Maifield. My car was feeling great and I had a pretty good start, battling with JP Richards and Maifield. I made a great pass on JP to move into 3rd, but then bobbled right away and he got back by. We would race hard and clean, passing multiple times, but that let Cavalieri catch us. We would tangle late race and I would drop to 5th behind Cavalieri. Not a great start, but my pace was fast. Race 2 : 6th/2nd : starting 6th with Cavalieri just in front of me this time. Again I would get a great start and move into 2nd after a few laps. Rob Gillespie was leading but me and Cavalieri were coming up on him. I was feeling good, good pace, staying ahead of Cavalieri, but I was struggling with this little double. I would either case it a little, or over jump it a little, and it was killing me. I over jumped and Cavalieri got side by side and made the pass. We both passed Rob when he crashed and I chased Ryan down, missing the win by a couple tenths. I keep giving up positions after I have them, you can’t do that at the Reedy Race. Race 3 : 3rd/2nd : I would start 3rd with Tessman starting out 1st. I had a decent start but had to battle some to get into 2nd, and by that time Ty was gone. I cruised home for 2nd. Race 4 : 5th/5th : This race had Phend and Evans starting out front and I was 5th. I got into 4th and had a great battle with Alex Kosciuszek, but Phend and Evans were a little ahead. The two leaders started battling and both tangled at the end of the straight. Alex K took the lead and I was in 2nd with Phend and Evans right behind us. I felt faster than Alex K, but just couldn’t get around. I was pushing hard to try to force Alex to bobble, but instead I did. I broke a little late and turned while braking after the front triple. There was a small bump there and I rolled over with only a minute or so to go. I went from feeling like I was gonna take my first win, to finishing 5th. I was pretty bummed to end day 1 like that. Saturday would be a mix between 4wd and 2wd. We would start with the final two rounds of 4wd, then we get a 2wd practice, and finish the day with two rounds of 2wd. My pace was great on day 1, but I was giving up too many positions. When you get a position at the Reedy Race, it’s key to not give them up, you have to take full advantage of every good opportunity. Race 5 : 9th/3rd I would start along side Spencer Rivkin on the last row. This time I would get tangled up in the first lap pile. I was 10th, then crashed all on my own again on the first lap. I was a DEEP 10th and about a half lap down. I had nothing to lose and just put my head down. My car felt the best it had so far and I was driving my best. I was making great passes and getting closer to the front. I got into 3rd with a couple laps to go and charged right to the back of Chad Due on the last lap. I tried everything I could, but finished 3rd. I was happy and mad, happy with my driving, but mad that I’m struggling to drive like that when I get a good start and good opportunities. Race 6 : 4th/2nd : I had a decent starting position and had Rivkin, Maifield, and Cavalieri all behind me. Got off to a good start but then had to battle with the first ever female racer in the Invitational class, young Malin Karlsen. She was driving great and getting better each race, but just a little off the pace compared to the top drivers. I was patient and waited for the right time and made my pass. Maifield was quickly by and we had a good battle. I wasn’t able to drive a mistake free, confident race like I needed to, and Maifield got by. I stayed really close and challenged, but finished 2nd. 4wd is over now and it’s on to 2wd. 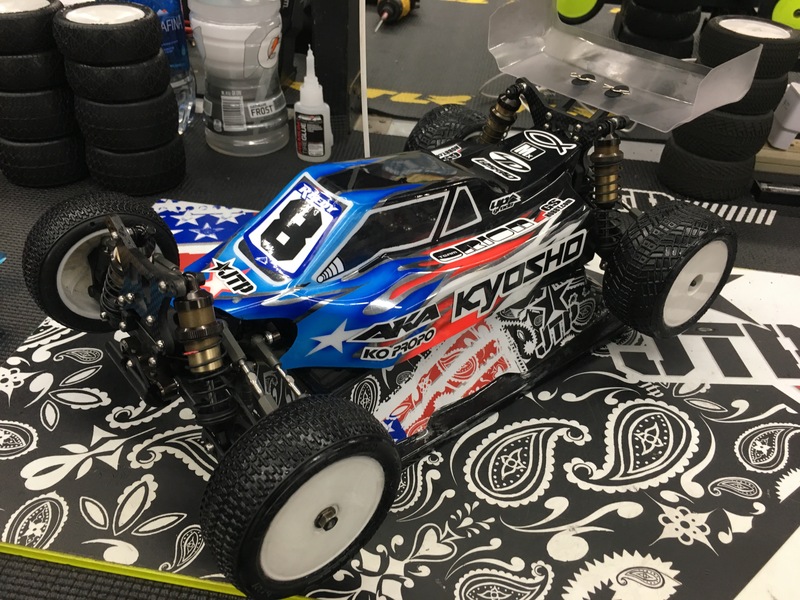 My Kyosho ZX6.6 was great, probably the best handling 4wd I’ve had at the Reedy Race, but I didn’t get the results I was capable of getting, I left a LOT on the table. I was sitting 8th in points and 5 points out of the lead. I needed really good drives in 2wd if I wanted to get on the podium. We did our 2wd practice and my car was feeling really good. I was ready to flip the page and get 2wd started. Luckily it seemed I had staked races with top drivers in all my heats. That’s a good thing when I need wins and other guys ahead of me need finishes worse than me. Race 1 : 1st/1st : My first front row start of the event, and I got a great holeshot. 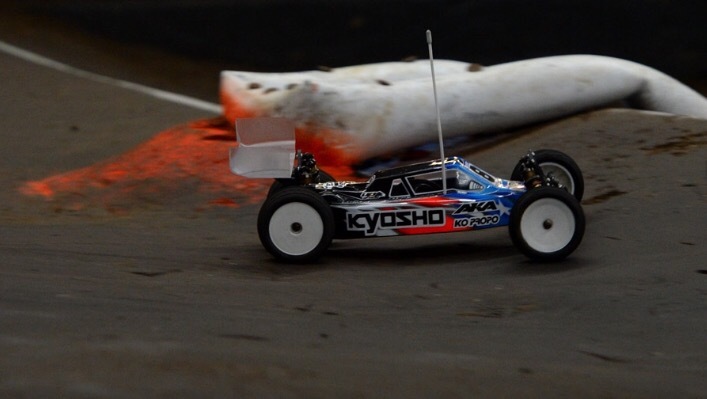 My Kyosho RB6.6 was amazing, I sprinted early and built a good gap, 3-4 seconds. Maifield and Phend were behind me, but my pace was great and I took my first win. Race 2 : 9th/2nd : I got a good start from 9th and worked myself forward in the first couple turns. I was almost in 3rd but then Rivkin clipped me as we were all in a big pile. I dropped way back. I pushed super hard and had a similar drive like in 4wd when I had nothing to lose. Cavalieri and Maifield were battling for the lead and I was up to 3rd. Maifield had a mistake and got into 2nd and the battle between Maifield and I was on. I drove confident and he tried everything to pressure me, but I held on to 2nd. Sunday Sunday Sunday. I had a great start to 2wd and worked my way up to 4th in the points. I need to really push for wins today and see how the cards fall. A podium is in reach for sure! Race 3 : 1st/2nd : I started inside front row, but in 2wd it was hard to get the lead from the inside as the outside had more traction. I was 2nd into the first turn and then got tangled with the leader later in lap one. Maifield came from 10th to 2nd in two laps and was right behind me. 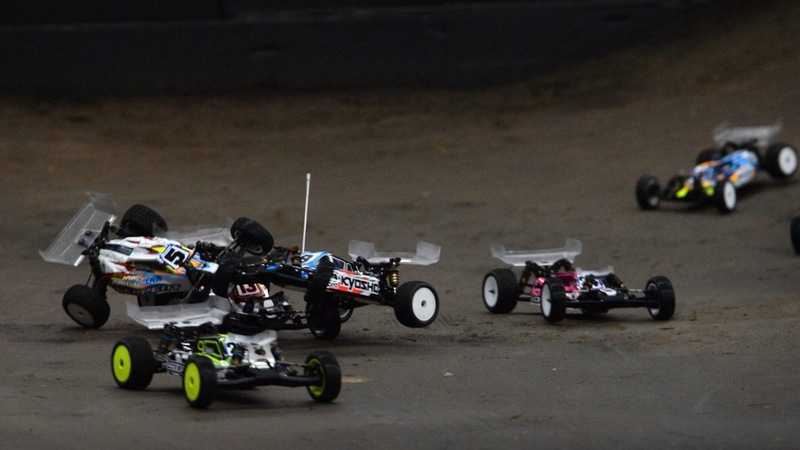 I got frustrated with that and didn’t drive good, losing a position I had….again….I would finish 2nd. That race really frustrated me and kinda set the tone for the rest of the day. Race 4 : 3rd/7th : I was really looking forward to getting back in the groove taking some more wins. I started inside second row and had Cavalieri behind me. 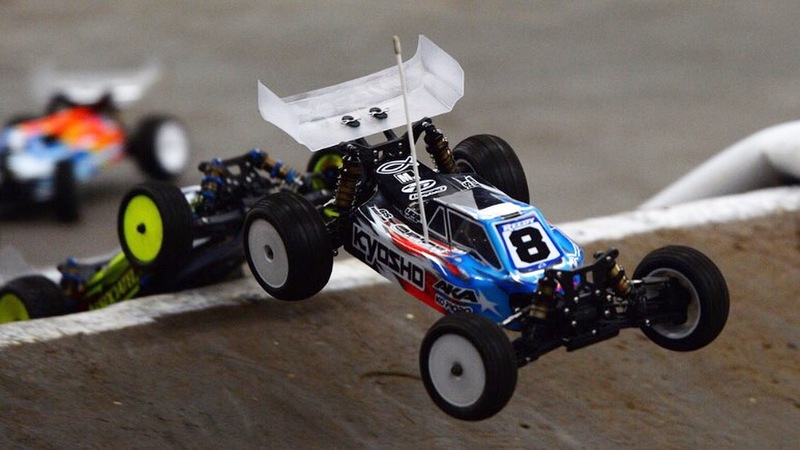 I wanted to get into the first turn in 3rd and went for it, having my Kyosho teammate on the outside of me. I got no room at all and got turned down on and ended up upside down and in 10th. I was super frustrated and crashed many more times to have my worst finish of 7th. Race 5 : 9th/6th : Starting back row I was actually excited as it seemed I got great starts from the back row. There was a super early pile in turn one and I went inside to try to get by. I got clipped and crashed, giving me another bad start. I was also trying a different set of tires, a set with a little more pin. I couldn’t really tell if I needed lower tires or if I was just driving bad and making my car feel loose. I finished 6th. Race 6 : 5th/4th : Headed into the last race I had no chance at finishing on the podium overall. I also had the two drivers fighting for the overall win, Maifield and Cavalieri, in my race. Starting 5th, I got drove really hard in the first turn again and was in a pile up. Not a great last race and I finished 4th. I think I hurt myself a lot by trying to run newer sets of tires, I should have kept my original set and ran them bald. I couldn’t get good jumps on the starts and just didn’t have the traction I had to start 2wd. Another Reedy Race has come and gone. This darn race still eludes me, and I want to win it really bad. I’m not happy at all with my performance, as I came in confident, prepared, and with great handling cars. 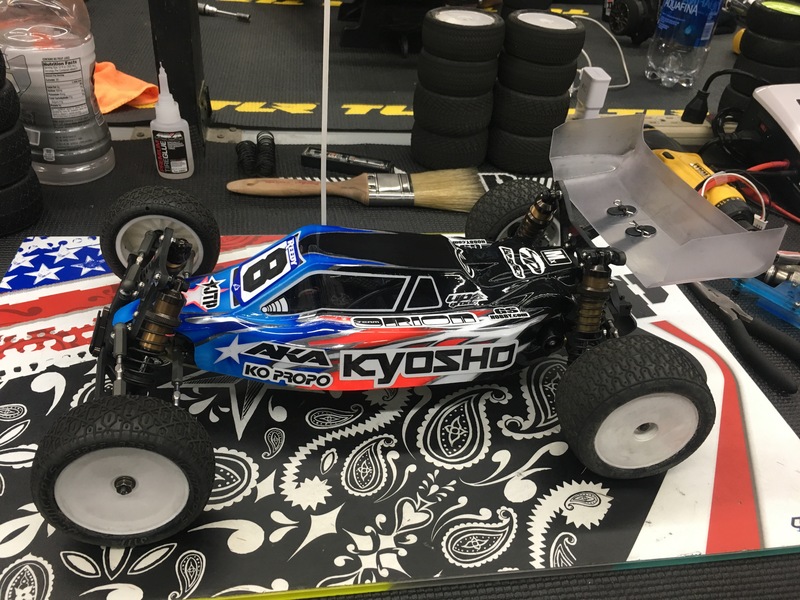 Thanks to my fans, my family, Joe Pillars, and all my sponsors : Kyosho, MX Racing, AKA, Team Orion, Ko Propo, GS Hobby, JTP, Upgrade-RC, TD Paint, Lunsford, MIP, and thanks to the Good Lord Jesus Christ. Thanks for reading and I’ll see you guys at another track soon, God Bless!